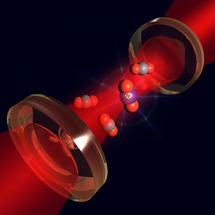 A new spectroscopic technique offers ultra-sensitive optical detection of radiocarbon dioxide. The approach shows promise as a measurement tool in many fields, including carbon dating and greenhouse gas detection. Researchers from Istituto Nazionale di Ottica (INO), within Consiglio Nazionale delle Ricerche (CNR), Italy have demonstrated a new compact spectroscopic instrument that offers a highly sensitive optical method for detecting radiocarbon dioxide concentration, which can be used to carbon date fossils and archaeological artifacts. The instrument, which uses a new approach called saturated-absorption cavity ring-down (SCAR), is described in The Optical Society's journal for high impact research, Optica. SCAR offers significant time and cost savings compared to the standard approach for carbon dating and could be useful for a host of other applications such as measuring emissions from fossil fuels or certifying the amount of biogenic content in biofuels. Current carbon dating processes require researchers to send a sample to a large facility with an accelerator mass spectrometer and then wait several weeks to get results back. Accelerator mass spectrometry measures the amount of carbon-14, or radiocarbon, present in a sample, which can be used to calculate its age. Around the world, only about 100 facilities house this equipment. "Accelerator mass spectroscopy can be used to carbon date bones, wood, fabrics or anything of biological origin, pinpointing its age of up to 50,000 years ago," said Iacopo Galli, a member of the research team. "Using our new technique, we can do something similar but with a lower cost and with a faster delivery time for the results." The researchers report that their SCAR instrument can detect radiocarbon dioxide concentration with a precision of 0.4 percent, which approaches the 0.2 percent precision of the best accelerator mass spectrometers. The new technique can deliver results in just two hours, with each test costing about half what it would if conducted using an accelerator mass spectrometer. The researchers estimate the SCAR instrument is about 100 times smaller and 10 times cheaper than the instrumentation required for accelerator mass spectrometry. Its size and cost could decrease even more once the instrument is converted from its current tabletop version to a more portable commercial prototype. "With a portable instrument, direct measurements could be conducted on-site, with results returned in a very short time," Galli said. "This could revolutionize the approach that archaeologists use for carbon dating because they would not have to send sensitive samples away to a lab and wait weeks for a result." The researcher team is also exploring several applications tied to the environment. For example, radiocarbon dioxide concentration measurements can be used to distinguish carbon dioxide created by burning fossil fuels from other sources of carbon dioxide in the atmosphere. "SCAR instruments could be installed at local facilities across a region to take measurements in different places at the same time, to determine the most important pollution sites," said Davide Mazzotti, a member of the research team. An initiative supporting carbon pricing was recently announced in December 2015 at the United Nations Conference on Climate Change, suggesting the demand for accurate local pollution-tracking technology could increase in the future. A device such as this could offer a way to tie a monetary cost, or tax, to pollution. "We developed a very general spectroscopic technique and showed that it can be used to detect radiocarbon dioxide," said Giovanni Giusfredi, a member of the research team. "In principle, we can use our apparatus to detect many other molecules such as methane, nitrous oxide and other greenhouse gases or chemicals of interest for national security or forensics." The SCAR device detects radiocarbon levels by measuring how laser light interacts with the carbon dioxide that is produced when a given sample is burned. For analysis, the carbon dioxide from a burnt sample is placed into the instrument's vacuum measurement chamber. There, a light beam emitted from a quantum cascade laser at 4.5 microns - an ideal wavelength for sensitive gas detection - interacts with the carbon dioxide inside a 1-meter-long optical cavity with highly reflective mirrors on each end. As the light repeatedly bounces between the mirrors, the radiocarbon molecules in the cavity absorb some of the light. The length of time it takes for the light to decay from its initial intensity is used to calculate the concentration of radiocarbon in the gas mixture in the cavity. The highly reflective mirrors create an effective path longer than 5 kilometers for interactions between the light and the gas sample. Even if the absorption is small for a single pass, thousands of passes provide enough absorption to detect even trace amounts of radiocarbon. "Although the instrument is relatively simple, the performance obtained by our system is a result of many years of studying of the physics of the various optical components," Giusfredi said. "Our group collaborated with other research groups in the U.S., Japan and Switzerland for the theoretical analysis and to study quantum cascade lasers." The researchers are continuing to refine their instrument and explore new applications. One of their next steps is to conduct SCAR analyses of samples that are significant to various fields, such as archaeological artifacts and biofuels, and directly compare these measurements with accelerator mass spectrometry results from the same samples. Paper: I. Galli, S. Bartalini, R. Ballerini, M. Barucci, P. Cancio, M. De Pas, G. Giusfredi, D. Mazzotti, N. Akikusa, P. De Natale; "Spectroscopic detection of radiocarbon dioxide at parts-per-quadrillion sensitivity"; Optica; 3, 4, 385 (2016).